225 Posts Tagged "web bad dog"
Does My Email Read idiotliveshere@cogdogblog.com? I am far from alone being in individual ramrodded by a company that takes your money for a service it does not provide. But these dinosaurs are in denial of the asteroids raining down on them, as the net empowers us to put their evil deeds into the light. This is my little experiment to see if a single, frustrated, beaten down customer can take on a giant smelly pirate. Help me out my casting foul words and links their way. Hence, I am here to tell you the tale of the Alltel Pirates and how they have me chained to their brig. Oh how foolish I was to fall for their ship! 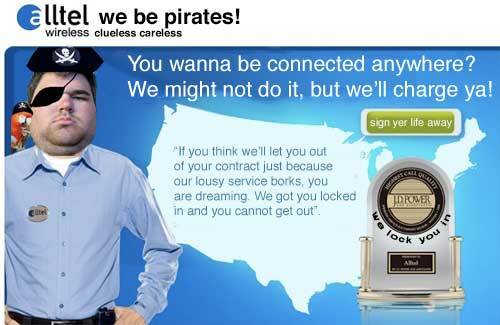 Mock up of Alltel.com site plus pirate face from cc licensed flickr photo Pirate Phobia. The wireless internet service my organization pays monthly fees for has failed to connect, repeatedly disconnected, or has been wrongly turned off over the last 2 months in such places as Houston, Orlando, San Francisco, Los Angeles, San Diego. We pay for a service not delivered. Multiple calls to tech support have failed to fix the issue and in the latest round, their advanced technical support claims that the equipment sold to me at an Alltel store, that worked fine for 4 months, is not supported in my Mac OS X computer. This is in conflict with the manufacturers own specs. So they sold me service and equipment they cannot support. According to their “retention department” any termination of service will result in my organization being charged a $200 termination fee. Once more, we have paid for a service not delivered and we must pay to get out of the contract. A contract is an agreement, where I agree to pay (which has been done) for a service to be delivered (which has not been done). I should not have to pay to break a contract that Alltel has not fulfilled. So instead, I wish to take them down via the power of the internet and social networking. Tell everyone you know NOT to sign up for ANY Alltel service. Spread the word. I am a die hard Google junkie. For more than 2 years, iGoogle has been home on every computer I use, while others clamor about their RSS tools, I just dig and dig Google reader, Gmail is my hub for all my non-twitter communication ;-) and I put all my time into Google calendar. Yet, I have a gripe. It’s the menus that are supposed to make it easy to be moving around my Googlespace. For the longest time, there were no menus in Google Reader. Then a few weeks ago, Reader just disappeared from all menus. It’s been a while since I barked about the clumsiness of LinkedIn but just had another one of those near deaths by lame interface design. But before that, i am still trying to fathom what LinkedIn offers beyond the ability to just link. It seems utterly recursive with no ending condition to stop the loop. I am sure I am missing the supreme benefit, and get tripped up by their spurious claims of benefit. Is it Spam if a Spammer Says It Isn’t Spam?